Carl Builder was one of The Marquardt Company team that developed the Air Force Scramjet Program. Builder, Charles Lindley [Lindley, 1963] and John Ahern were responsible for developing the thermodynamic analysis for the scramjet. The standard approach for the ramjet and its extension to scramjets was based on an isentropic stagnation conditions analysis where First Law inefficiencies were evaluated in terms of stagnation pressure losses and an aerodynamic analysis of the engine flow path based on local Mach numbers and aerodynamic characteristics. For a subsonic through-flow engine (ramjet) where the heat addition is done at subsonic speeds, and where maximum pressure and temperatures do not exceed (typically) 20 atmospheres and 1,800 K, this type of approach is very acceptable. However for supersonic through-flow engines (scramjet) the heat addition is at supersonic Mach numbers and the Fanno and Rayleigh solution characteristics change sign [Scott and Riggins, 2000]; the isentropic stagnation pressure and temperature can reach 1000 atmospheres and 6,000 K. For this case a different approach was sought, and it was based on static conditions, not stagnation, the cycle being analyzed using a Second Law approach based on un-recovered (lost) available energy and entropy increases [Builder, 1964]. The original work was done in the late 1950s. By 1960 the Air Force Scramjet program associated with the aerospace plane began falling apart and this group sought employment elsewhere. Builder joined the Rand Corporation in the strategic planning department, giving up on further scramjet work because his work had been so close to completing a successful program and yet it was to be scrapped arbitrarily in favor of rockets. At the urging of The Marquardt Company scramjet manager, Artur Magar, Builder finally published a partial description of the approach in 1964. One of the authors (PC) and a colleague from Douglas Aircraft Company, Gordon Hamilton, visited Builder in 1984 to discuss the unfinished portion. As a result a paper was prepared that documented the complete approach [Czysz, 1988a]. Although the original paper is now over 40 years old, the conclusions reached by Builder are as applicable today as then. In fact in reading this book the reader should come to the same conclusions. 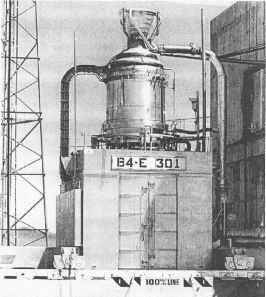 The tragedy is that in the intervening 45 years there has been no change in the space launchers propulsion systems, design or fabrication. Forty years after the Wright Brothers' first flight, jet power aircraft were flying in both Britain and Germany and by 50 years the first commercial jet transport was approaching operational status in Britain. As in the past, each rocket flies for the first, last and only time. The following paragraphs are Builder's conclusions from 1964, verbatim. Before summarizing, it would be well to note that the analyses and figures presented are based upon an ideal gas analysis. It is well recognized that the behavior of air is not ideal at high temperatures, above about 3500 or 4000°R. However. this analysis is restricted to the static conditions throughout the cycle, so the errors due to nonideal behavior may not be as large as they would if stagnation conditions were being used. For example, the optimum compression enthalpy ratios determined in this analysis are generally under ten, which means that the temperatures at the end of the compressive device would be under 4000° R, because of this, it is believed that the trends and characteristics which have been presented for the Brayton Cycle family are quite valid, even if the specific values or curves are subject to adjustment for nonideal gas effects. What conclusions can be drawn from this treatment of the Brayton Cycle family of airbreathing engines? First: we should note that a thermodynamic analysis on Mollier coordinates for the static gas conditions provides a consistent treatment of the complete spectrum of engines in this family. Second: an optimum amount of compression can be defined which depends only upon the overall processing efficiency of the heat-energy input of the cycle. That optimum amount of compression is compared to that available from ram stagnation of the engine airflow, a clearer insight is gained into the factors, which are common to the natural evolution of the turbojet, the conventional ramjet, and the supersonic combustion ramjet. Third: the energy conversion efficiency of the Brayton Cycle appears to continuously improve with speed, even approaching orbital velocities. It has been shown that the amount of compression is an important consideration in determining the energy conversion efficiency. Thus, we should not be overly preoccupied with the efficiency of compressive devices or the attainment of the maximum amount of compression possible. It is over-compression which causes the drop-off of conventional ramjet efficiencies above 10,000 fps. Finally, what does this analysis tell us with respect to potentially new engines lurking in the spectrum of chemical airbreathing propulsion? The turbojet, conventional ramjet, and super sonic combustion ramjet are clearly the dominant occupants of the three distinct regions of desired compression: mechanical, stagnation, and partial diffusion. However, we seem to lack engines for the transition regions. The turboramjet is a hybrid, which spans two of the three regions, but is probably not the best possible choice for the region in-between. In the Mach 3 to 5 regime, an engine having very modest mechanical compression with high processing efficiencies might be very attractive. In a sense, a fan-ramjet might be a suitable name for such a cycle; .the duct-burning turbofan and the air-turborocket could be considered close cousins to this hypothetical engine. At the higher speed end, around Mach 10, we can postulate a very efficient engine called the transonic combustion ramjet. There is still another important class of possibilities offered just outside the confines of the Brayton Cycle family: engines with non-adiabatic compression and expansion processes as a result of heat exchanges between the air and fuel. We might find a complete new spectrum of such engines awaiting our discovery. At the time Builder wrote the AIAA-64-243 paper a major effort was underway to develop, in a single engine, the characteristics of both a turbojet and ramjet. The concept was called a turboramjet [Doublier et al., 1988; Escher, 1966a].